Light: Recognizing your needs and taking action to fulfill them. Doing as much as you can do with what little you have. Admitting you need help. Embracing the aid that comes your way. Focusing on what you have versus what you don’t. Looking for the light at the end of the tunnel. Shadow: Exaggerating your financial or physical needs. Adopting a poverty mentality. Refusing to support yourself. Refusing offers of support. Playing the martyr. Turning down opportunities to improve your health or finances. Wallowing in misery. Story: The Main Character refuses to see how he or she can be aided by others. Relationships. No matter how much is given, some people never feel they have enough. A relationship that drains your wallet and spirit may prove too expensive to maintain in the long run. If you accept offers of aid from loved ones, be sure you define and stick to the terms of repayment, or be prepared to lose the relationship. Work. Too few customers. Too few innovations. Too few resources. All too often, we focus on what we lack. Turn this around by taking a fresh look at the resources you do have. Watch for offers of help. Consider mergers and partnerships. Rather than focus on the deficits, consider what could be. Spirituality. Faith can turn trial into triumph. Rather than give in to a depletion of spirit, turn to your faith for support. Turn a difficult situation over to your higher power. Pray for guidance. Be bold: ask the Universe for what you really need. The response may surprise you. Personal Growth. Whining achieves nothing. If the situation is unbearable, it’s time to define exactly what resources you have on hand and what needs are critical. Prioritize! By focusing on what you can actually do, you’ll avoid the trap of self-pity and depression. Fortune Telling. Finances are getting tighter. Prepare for a setback. When? Between April 21st and 30th. The Destitute Figures. The pitiful people on many RWS-inspired versions of this card are in dire straits indeed. Starving, freezing, and wounded in both body and spirit … they limp right past an opportunity for aid. When feeling down, don’t forget to look up. The Stained-Glass Window. 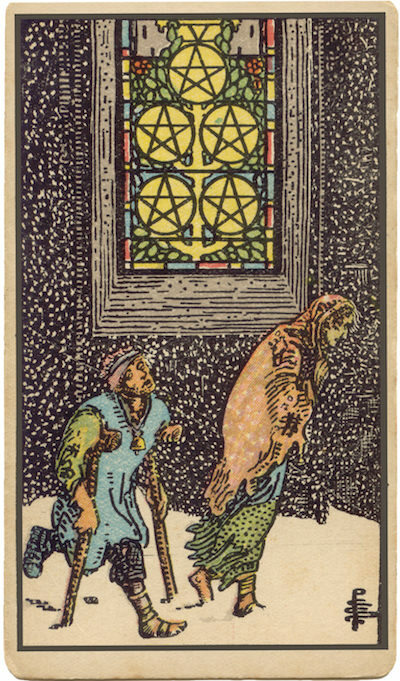 Many versions of this card depict a stained-glass window—which, by association, suggests a church. What organizations could come to your aid? What groups of people might leap at the chance to be involved in your situation? What keeps you from approaching them? The Distractions of a Crisis. When things are going wrong, strong emotions can interfere with making practical choices. To what extent might strong emotions be blinding you to quick and easy solutions? The Marseilles Image. Four Coins, entwined with vines, surround and isolate a fifth. The central Coin, isolated from the others, cannot benefit from the resources they represent. How does isolation figure in your situation? How might your situation be enriched by reaching out to others? What critical resources do I lack? What people or groups would come to my aid if I asked? How might an impoverished spirit be impacting my physical or financial condition?